Australia & New Zealand – AUSTRALIA TOURS Australia Tour Packages Cosmos introduces Australia in 2018!! Embark on the adventure of a lifetime in the “Land Down Under” – amazing Australia. A world of adventure, mystery, natural wonders, and famously friendly people, Australia also offers exciting cities, epic land- and seascapes, and a wealth of cultural tradition to discover. Your affordable Australia tour offers fantastic sights and excursions to explore the incredible geological wonders of the outback, the Great Barrier Reef, and Australia’s exciting metropolitan cities. From the spectacular sea life of the world’s largest coral reef system, to the strikingly distinctive Sydney Opera House, you’ll find amazing options to explore during your budget-minded Australia vacation. Your knowledgeable Tour Director serves as your personal resource for all there is to do, see, and explore. Cosmos invites you to enjoy a budget-minded tour of Australia’s vibrant cities, explore the the wilds of the outback, and marvel at its environmental diversity. Join us in saying, “G’day!” to your biggest adventure yet! Asia – The Cosmos quality, value touring formula makes travel to Asia truly affordable. Cosmos’ famous low prices—with nearly everything you need in a vacation already included—allow you to visit exotic locations in Asia, like Thailand, China, Japan, Vietnam, and Cambodia, without spending a fortune. Whether you have always wanted to try on a kimono in Tokyo, explore the Great Wall of China, or cruise on stunning Ha Long Bay in Vietnam, now you can discover Asia’s most iconic sites on a Cosmos Asia travel package. Highlighting Thailand and Cambodia’s rich histories, fascinating cultures, and religious monuments, this Thailand and Cambodia tour includes overnights in Siem Reap, Bangkok, Kanchanaburi, Ayutthaya, Phitsanulok, Chiang Rai, Chiang Mai, and Phuket. Your budget-minded tour of Cambodia starts in Siem Reap to visit the magnificently preserved temples of Angkor Wat, Angkor Thom and Bayon Temple—with some 200 faces carved into 54 towers. You’ll also visit the exquisite 10th-century Banteay Srei and Ta Prohm, where ancient jungle tree roots wind through the temple ruins. Your tour through Thailand includes visits to some of the cities that have served as the country's capital: Bangkok, Ayutthaya, and Sukhothai. In Bangkok—Thailand’s current capital—visit the Temple of the Golden Buddha; the Temple of the Reclining Buddha built in 1832; and the Grand Palace, the royal residence begun in 1782 where you’ll see the Emerald Buddha, Thailand's most sacred Buddhist sculpture. In Ayutthaya, Thailand’s ancient capital, your sightseeing includes a visit to Bang Pa-In Palace, which was built as a summer residence for the Kings of Ayutthaya. In Sukhothai, Thailand's 13th-century capital, visit Sukhothai Historic Park, a UNESCO World Heritage Site with ruins of palaces, temples, and homes. On this Thailand tour, you'll also have an opportunity to learn about the Thai culture. In Bangkok, enjoy a Thai dinner accompanied by Thai classical music and dancers. Visit the legendary Damnoen Saduak floating market and see traders sell exotic fruits, vegetables, and more from their boats. And in Chiang Mai, enjoy a visit to San Kampaeng to see local craftsmen make Thailand's traditional lacquerware and antique wood furniture. But that’s not all…visit the “Golden Triangle,” where Thailand, Laos, and Myanmar meet, and take a train ride over the famous River Kwai Bridge, part of the infamous Death Railway built by prisoners during World War II. Visit Hellfire Pass Memorial, which houses a museum detailing the life of the Allied prisoners and Asian laborers who helped build the railway. You’ll also spend time at an elephant sanctuary, where over 30 elephants room freely in a sustainable environment free from mistreatment. The perfect conclusion to your Thailand experience will be in the perfection and paradise of Phuket. Relax with 3 days of aquamarine water, pristine beaches, and pampering services available if you choose. Your budget-travel to Thailand is rich in experiences, sights, and welcoming people you’ll long remember! Private, deluxe, air-conditioned motorcoach while touring in Thailand. Sightseeing vehicle in Siem Reap. Inside visits and special features are shown in UPPERCASE in the tour description. SIEM REAP, CAMBODIA. Welcome to Cambodia! Your hotel room is available for mid-afternoon check-in. SIEM REAP. Today, visit the exquisite 10th-century BANTEAY SREI, a unique temple dedicated to the Hindu god Shiva that was built on a small scale from red sandstone, which can be carved like wood. Unlike the other temples, TA PROHM has been left relatively untouched. Surrounded by jungle, tree roots grow over and through the ruin walls, and you will experience the temple with the same wonder as the early explorers who discovered it. SIEM REAP–BANGKOK, THAILAND. Today, fly to Bangkok, Thailand’s capital city. Enjoy the rest of the day at leisure. BANGKOK. Bangkok is an exhilarating blend of historic and religious monuments, chic modernity, exciting shopping, and friendly culture. An exciting day of sightseeing is ahead. Take in the city’s principal landmarks such as the splendid TEMPLE OF THE GOLDEN BUDDHA and the spectacular TEMPLE OF THE RECLINING BUDDHA, the oldest and largest Buddhist temple in Bangkok. You will also visit the gleaming GRAND PALACE, Thailand’s most sacred monument, and the spectacular TEMPLE OF THE EMERALD BUDDHA. This evening, enjoy a special THAI DINNER, accompanied by Thai classical music and dancers. BANGKOK. Explore Bangkok at leisure, perhaps enjoying the great-value shopping, lively market, and delicious Thai cuisine. BANGKOK–KANCHANABURI. Visit the legendary DAMNOEN SADUAK FLOATING MARKET, where traders sell all manner of items from their boats, including exotic fruits, vegetables, silks, and toys. Then travel to Kanchanaburi on the banks of the Kwai River, famed for the River Kwai Bridge, built during WWII. Visit the ALLIED FORCES CEMETERY and spend time in the fascinating THAILAND-BURMA RAILWAY CENTRE. Today’s highlight is a TRAIN RIDE across the famous bridge to Wang Po Station. This afternoon, visit HELLFIRE PASS MEMORIAL, part of the Death Railway that cuts through the mountains. Today, it houses a museum detailing life of the Allied prisoners and Asian laborers who helped build the railway, and subsequently suffered or died at Hellfire Pass. KANCHANABURI–AYUTTHAYA. Today, head to Ayutthaya, ancient capital of Siam. Here, you will visit BANG PA-IN PALACE, which was built in the 18th century as a summer residence for the Kings of Ayutthaya. PHITSANULOK–SUKHOTHAI–CHIANG RAI. Journey to Sukhothai, Thailand’s 13th-century former capital, and admire the atmospheric, moated Old Town. Here, you will visit SUKHOTHAI HISTORIC PARK, a UNESCO World Heritage Site, and explore ruined temples and monasteries, including WAT SI CHUM with its stunning seated Buddha. Later, travel through rural countryside to Chiang Rai. CHIANG RAI–CHIANG MAI. This morning visit WAT RONG KHUN, also known as the White Temple. Then, continue through lush jungle to Chiang Mai, a fragrant mountain retreat known as the “Rose of the North” for its refreshing climate. Upon arrival, visit SAN KAMPAENG to see local craftsmen make Thailand’s traditional lacquerware and teakwood furniture. CHIANG MAI. Today is free for you to enjoy this dynamic city. You may opt to join our optional Thai cooking class and learn the secrets of traditional dishes. 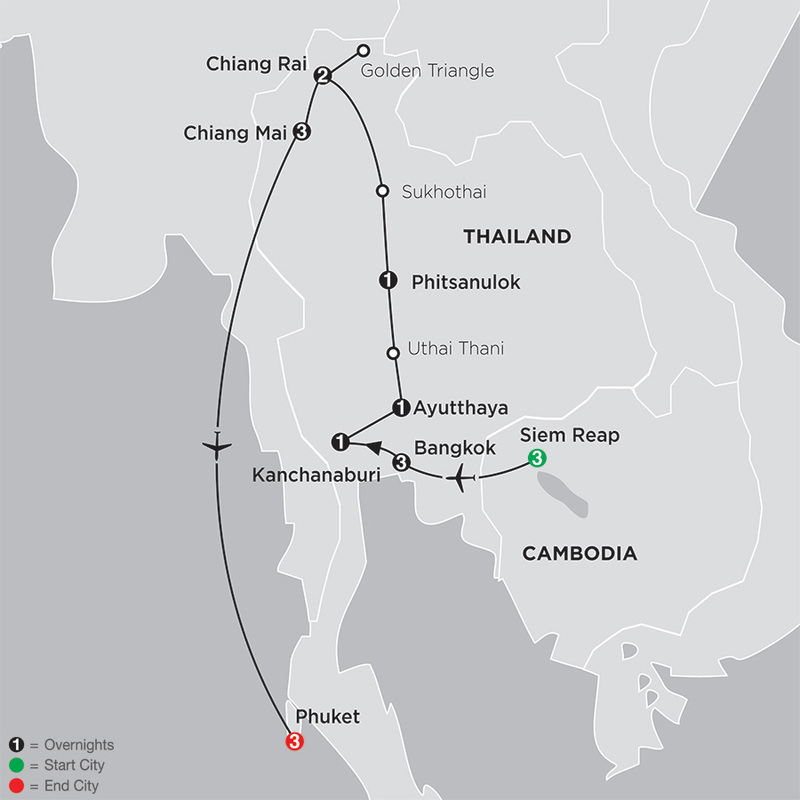 CHIANG MAI–PHUKET. Today, transfer to Chiang Mai airport for your flight to Phuket. On arrival, you will be met by a local representative and transferred to your hotel. PHUKET. Your tour ends with breakfast this morning. "I'm Tony, and I've been working as a Tour Director since 2005. I love my profession and sharing the history and culture of Thailand with visitors from around the world. I look forward to meeting you." The following optional excursions may or may not be offered, and availability is subject to days of operation and seasonality. Please select a departure date to view optional excursions and pricing for a specific date (due to currency fluctuation, pricing shown is subject to change until purchased). Learn more about travel with Cosmos! We can make planning your tour easy – all you need to do is complete the information below. A Cosmos specialist will get in touch with you to provide you a quote on your escorted tour. You can also call us at 1800 425 3575 to speak to someone right away. We use your personal information only for the purposes of responding to your requests. Provide when you want to go - Travel Dates or Month and Year? Thank you for your referral. We appreciate it. You will receive an email with the information you submitted. Please validate by replying to the mail. The Referral Program is offered by Globus family of brands vacations and solely applicable on our vacations. Referring Travelers (you) must have traveled with us previously and have completed travel. Verification of past travel history will be done by the Globus family, once details are provided. Only verified past traveler's will be eligible. For each eligible new traveler (friend) you refer, we'll issue you $25 credit upon completion of travel of the referred travel. For each new traveler, only one past traveler may claim credits. Referred Travelers (friend) must be new to Globus family vacations. They must not have booked or traveled with us in the past and must not have a pre-existing booking for future travel. The Referred traveler (friend) must advise the booking agent your name at the time of making the reservation. Otherwise, the credit is no longer available for you. Credit for a referral will be paid only once for the friend on the first tour taken by him/her. Savings are $25 per booking for the referring traveler on any Globus family of brand vacation and $25 per booking for the friend booked on the Globus family of brand vacation. Referring Travelers can use the savings up to two years from the date of first referral. Referring Travelers will get the benefit for up to $250 travel credits & you need just 10 referrals! You can use these travel credits against a single Globus family of brands vacation. Only one person can redeem travel credits against one booking. Referral credit is combinable with all consumer promotions applicable at time of booking. Credits cannot be exchanged for cash nor is it transferable to another traveler. It can be applied only as a credit on a Globus family of brand vacation. Credits cannot be used against booking deposit, pre-paid gratuities, optional excursions, trip protection or against cancellation penalties of a booking. Credits are not valid for pre-existing bookings made prior to referral being given. Credits can’t be applied retroactively post full payment and applies to new bookings only. Decision of Globus family of brands will be final in case of any dispute. Travel Agents are not eligible for the referral program and cannot use this for their own travel or use for their own clientele. Vacations subject to standard terms and conditions as mentioned in the brochure/website.